"I tried to stay as healthy as possible. Tried to use low-sodium items wherever I could. My husband really liked it." Mix ground beef, chopped onion, celery, milk, chopped mushrooms, and panko together in a large bowl; shape into 10 patties. Mix all-purpose and whole wheat flours together in a wide, shallow bowl. Dredge patties in the flour mixture just to coat and move to a platter, taking care to not stack the patties. Heat 2 tablespoons oil in a large skillet over medium-high heat. Cook patties in hot oil until browned, 3 to 5 minutes per side. Arrange browned patties in a slow cooker crock. Heat remaining oil in a small skillet over medium heat. Cook and stir sliced mushrooms and sliced onion in hot oil until tender, about 5 minutes. Stir cooked mushroom and onion mixture with cream of mushroom soup, beef broth, Worcestershire sauce, onion gravy mix, and black pepper together in a bowl until smooth; pour over the beef patties in the slow cooker. Cook on High until patties are very firm, hot, and grey in the center, 3 to 3 1/2 hours (or on Low for 4 to 5 hours). An instant-read thermometer inserted into the center should read 160 degrees F (70 degrees C). 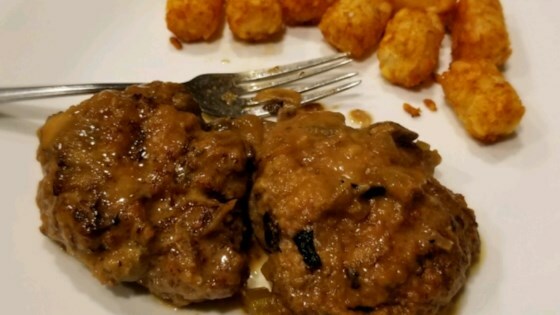 See how to make simple, savory Salisbury steak in the slow cooker. LOVED IT! I messed up my burger patties and they crumbled it the crock pot, but it was still awesome on top of baked potatoes! I made it dairy and gluten free because of allergies in my family. it was very delicious! Yes I did add minced garlic. Delicious! My husband helped me with putting it together while camping. Everyone loved it. I substituted a can of cream of chicken for one of the mushroom soups. Perfect for a fall evening!